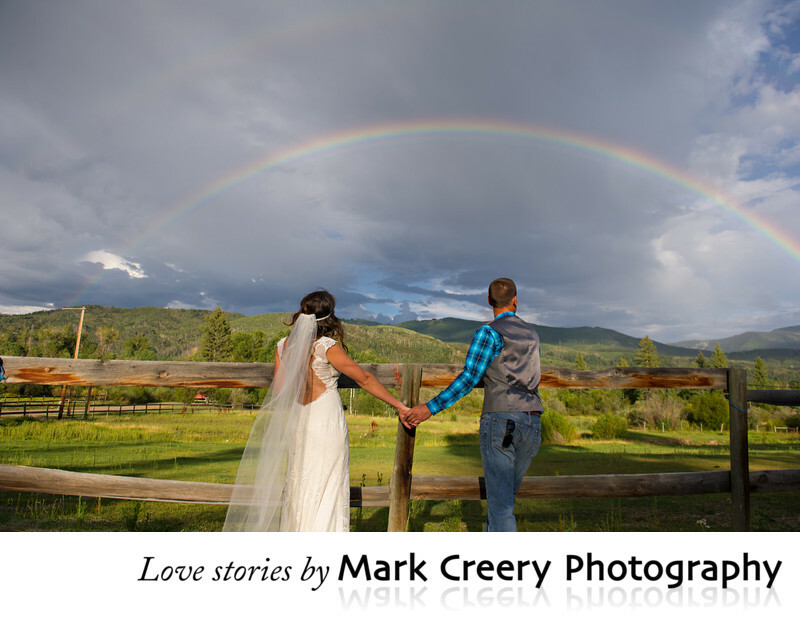 These wedding photos were taken at Perry Mansfield Performing Arts School & Camp in Steamboat Springs, Colorado. Perry Mansfield is a unique Colorado venue that offers a variety of scenic options for photography. Their beautiful aspen grove is a perfect ceremony location, with towering mature aspens all around. You can imagine how this would look in the Fall with the changing colors. There are many charming cabins to house your guests on-site, as well as rustic barns, fields, and small lanes for unique photo locations. The bride love horses, and actually worked at the camp for over 10 years helping with teaching horse riding. She had her own horse there still as well, so she decided to ride in on the horse to her ceremony. Two junior bridesmaids lead two ponies down the aisle as part of the processional, which was amazing. They also had their two dogs walk down as well. It really was a wild and entertaining day! This wedding photo is from a wedding with an antique bohemian chic them. The bridal party wore lacy antique-style dresses with cowboy boots while the groomsmen wore blue plaid shirts with jeans, cowboy hats and boots. This amazing scene of a double rainbow happened during the cocktail hour in a barn paddock and was a site to behold. It came without having to endure a big rainstorm either. If you're looking for a wedding photographer in the Steamboat Springs area, I can tell your wedding day story with style. Perry-Mansfield Performing Arts School & Camp is located in Steamboat Springs, Colorado. Contact: (970) 879-7125, connect@perry-mansfield.org. Location: 40755 Co Rd 36, Steamboat Springs, CO 80487.